← Community Camp Out Meets Retail Therapy! National Night Out is a simple idea: get neighbors together to build community spirit, improve police partnerships and prevent crime. Brilliant! For nearly three decades, neighborhoods across the country have set aside one night every August to host NNO events. This year’s event, held on August 2, attracted 37 million participants from 15,000 different communities. One of those communities was Siena in Las Vegas, Nevada. Managed by CCMC since inception, Siena is an age-privileged community of 2,001 households. A longstanding Siena tradition, their version of NNO includes live music, a cookout, community partnership booths, plus many raffles, prizes and giveaways. This year, it also included a little something extra — a Congressional Recognition Award, presented by the United States Congress. The Congressional Recognition Award is presented to select groups for any act congress deems invaluable. The Siena Community Association received their award for their 8-year commitment to hosting NNO, as a reflection of their efforts to protect residents and make safety a priority. 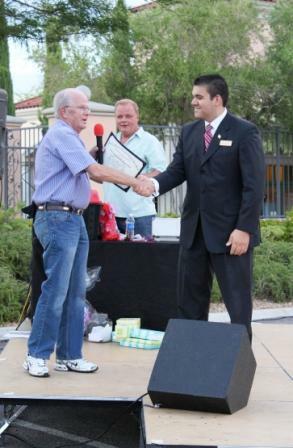 The award was presented by Nevada Congressman Joe Heck’s office in front of a crowd of more than 300 residents and 35 community partners. CCMC lifestyle director Justin Martin and board president Joseph McKenna accepted the award on behalf of the community association. The entire board of directors and the 30-member CCMC management team were all applauded for their work and commitment to keeping Siena residents safe. Congratulations to the Siena Community Association for this prestigious award!